Along with the Super Cub and the Cessna 206, the Cessnas 180 and 185 form the backbone of the professional bush pilot's equipment list in Alaska. However, while various examples in this book refer to the Super Cub or the Cessna 206 specifically, the Cessna 180 and 185 (unless otherwise noted) will be discussed as if they were the same airplane. As a form of shorthand, I will call them the Cessna 180/185. This is more than mere convenience, for just as Detroit offers the same automobile or truck with the option of different size engines, so Cessna offered the same basic airframe with the choice of small or large engines. The only relevant difference between the Cessnas 180 and 185 is engine power. Otherwise, they share the same fuselage, wings, control surfaces, horizontal stabilizer, and main landing gear (the Cessna 185 has a locking tailwheel). The late models of both are six-place high-wing conventional-gear airplanes of metal construction. The Cessna 180 is equipped with a carbureted Continental 0-470-U engine rated at 230 horsepower. The Cessna 185 is equipped with a fuel-injected Continental IO-520-D engine rated at 285 horsepower continuous, with 300 allowable for five minutes at takeoff. A look at the specifications reveals what the different engines have to offer. These specifications are at gross weight; with the Cessna 180 and 185 carrying the same load, the takeoff, climb, and ceiling would be different, with all advantage to the Cessna 185. On those missions that require you to fly into very remote areas where refueling facilities are not available and you are unable, for one reason or another, to land en route and refuel from five-gallon cans carried in the cabin. For example, most of the Canadian Northwest Territories falls into this category when you have to operate on wheels. On economical grounds, the Cessna 180 gets the nod when the airplane is on wheels and based in a local area where trip lengths rarely exceed 200 miles. In this situation, gross weight will be limited primarily by cabin volume and fuel weight will seldom go over 182 pounds. As the Cessna 180 is about $15 per hour cheaper to operate than the Cessna 185 (because of fuel and engine costs), you can bid jobs at more attractive rates than you could if you had to use a Cessna 185 for this purpose. In difficult economic times (such as Alaska is going through as this book is being written), this price break, small as it is, might offer some assistance to your customers. Markedly better takeoff and load-carrying performance on wheel-skis and floats. Not only do wheel-skis and floats seriously compromise your payload because of their weight, they also require large amounts of power to overcome surface drag during the takeoff run. Here, there is no comparison between the Cessna 180 and 185; the Cessna 185 is always the winner. The ability to carry full cabin loads for reasonable distances even with the weight penalties imposed through the use of floats and wheel-skis. 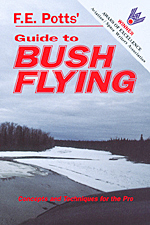 With fairly light loads -- about what would be considered gross for a Super Cub -- the Cessna 180/185 is capable of operating out of gravel bars measuring 500 feet in length under Northern conditions (see Section II, and Chapter 25 in Section III). Tires. The best tire for the Cessna 180/185 is the 8:50x6. The 25-inch tundra tires should be avoided as, when inflated correctly, they are too flexible for the Cessna spring gear. This is especially true when used under conditions of strong crosswinds on paved strips. Tailwheels. Some operators use the 5:00x5 tire on an oversized fork with the Cleveland wheel. This is an improvement, especially on soft rocky strips where the standard tire assembly not only has a tendency to dig into the ground like a plow, but gets rather chipped up. Beyond this, no other modifications are needed.